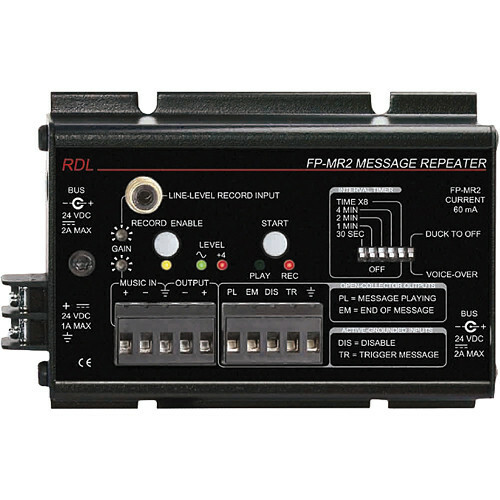 The RDL FP-MR2 Message Repeater permits electronic storage of a single recording of up to a duration of 1 minute 40 seconds. This recorded message may be played back manually using an external contact closure to ground or using the front-panel start button. The message may also be played back periodically using the interval timer included in the FP-MR2 Message Repeater. A balanced line-level music input allows background music to be connected and the associated input potentiometer allows the installer to set the music level. When message playback is triggered, the music is faded down. At the conclusion of the message, the music level fades back up. A front-panel DIP switch sets the music to fade under the message (-20 dB nominal) or completely off (used for messages containing music). The module output level is a nominal +4 dBu balanced. The output level is indicated on an RDL dual-LED VU meter which is used to set the proper music and recording levels. The message may be recorded once, at installation, and then played back repeatedly. The message may be re-recorded at any time and is retained when power is removed from the module. The recording input is a standard -10 dBV consumer level, unbalanced phono jack. An input level trimmer is provided to set the correct recording level which is indicated on the dual LED meter. The front-panel record enable push-button erases the message in memory and enables recording, indicated by the record enable LED. The module begins recording when the start button is pushed and continues until the button is released. The REC LED is illuminated during recording. An integral audio compressor maintains a consistent average recording level over 20 dB input of level variation without significant audible effect on the signal dynamics. Box Dimensions (LxWxH) 7.2 x 5.1 x 2.4"